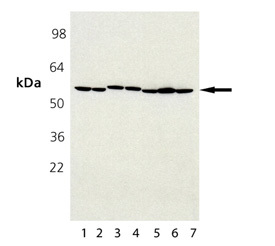 Western blot analysis of ERp57, mAb (MaP.Erp57) (Prod. no. ADI-SPA-725) : Lane 1: HeLa Cell Lysate, Lane 2: HeLa Cell Lysate (Heat Shocked), Lane 3: MDCK, Lane 4: MDCK (Heat Shocked), Lane 5: CHO-K1, Lane 6: ESK-4, Lane 7: Vero.